Metro's new maintenance plan will close the system at midnight every day, implement continuous single-tracking and shut down parts of the rail line for the next year. Metro General Manager Paul Wiedefeld detailed his "SafeTrack" plan Friday at a news conference, a day after stunning video of the fire and explosion at the Federal Center SW station prompted the closure of the station for repairs. The "safety surges" will take place at 15 locations over the next year. The plan includes closing the system down at midnight every night, implementing long-term single-tracking between a number of stations and closing five sections of rail completely. The system usually closes at 3 a.m. on Fridays and Saturdays. At times, Metro will also begin to wind down service immediately after rush hour, single-tracking starting at 8 p.m. every night. 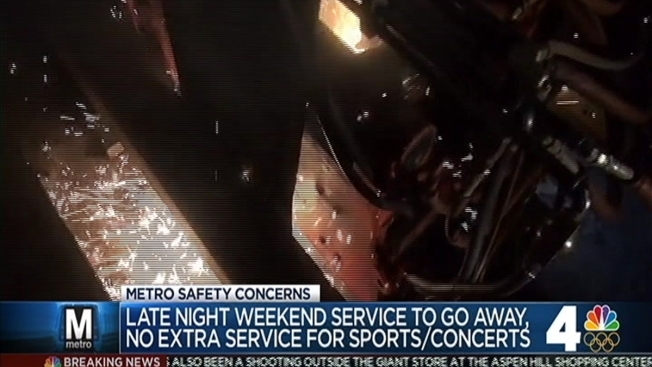 Under SafeTrack, Metro wouldn't extend hours for special events, like concerts or Redskins games. Wiedefeld said SafeTrack will increase track access and productivity, shortening the amount of time it takes to complete work from 10 weekends to 21 days. The plan aims to complete in one year, work that would usually take three years to complete. Peak fares will not be adjusted during this time. Local jurisdictions will have the opportunity to comment on the plan and respond by mid-May. The aggressive maintenance plan will begin with the Blue Line on June 4. For 15 days, trains will continually single-track between Franconia-Springfield and Van Dorn Street. Wiedefeld said the plan will affect 18,000 weekday trips. Buses will shuttle passengers to other stations. All other Blue Line stations will have normal service. Even though the larger plan begins in June, non-rush hour work will increase immediately. SafeTrack will affect rush hour commutes, and Wiedefeld said he has informed the Office of Personnel Management about what's coming. "This is a military operation. A massive undertaking. No doubt about it," Wiedefeld said. From June 20 until July 3, trains will continuously single-track between Greenbelt and College Park on the Green Line. Trains will leave Greenbelt every 12 minutes. Customers are encouraged to use New Carrollton or College Park as alternates. The amount of work that will be done is huge, and involves rebuilding tracks from the "ballast on up." The majority of the work will be done using continuous single tracking, but five sections of rail will shut down completely. Wiedefeld has said the shutdowns will only affect two to three stations at a time. The shutdowns will include Ronald Reagan Washington National Airport to Braddock Road, Pentagon City to Ronald Reagan Washington National Airport, Eastern Market to Benning Road, NoMa–Gallaudet U to Fort Totten and Rosslyn to Pentagon. The shut down between Ronald Reagan Washington National Airport and Braddock Road will begin July 5 and last until July 12. The closure will affect 50,000 weekday trips and reduce rail service south of the Pentagon by 50 percent. Shuttle buses will operate between Braddock Road, Crystal City and Pentagon City. The next shut down will happen between July 12 to July 19 between Ronald Reagan Washington National Airport and Pentagon City. Rush+ service will not be available on the Yellow Line during this closure. Continuous single-tracking will pick back up July 20 between Greenbelt and College Park. It will last until July 31. The SafeTrack plan will begin work on Metro's busiest line on August 1. Red Line trains will single-track between Takoma and Silver Spring from August 1 until August 8, affecting 94,000 weekday trips. All Red Line customers should consider alternatives. On August 9, Red Line trains will begin single-tracking between Shady Grove and Twinbrook. Single-tracking between Shady Grove and Twinbrook will last until August 19. Work on various lines will continue through May 8, 2017. Last month, Wiedefeld made an unprecedented decision to close the system for a day for emergency inspections and repairs of third-rail power cables. Several recent fires on the tracks have been blamed, in part, on faulty or poorly maintained power cables. The National Transportation Safety Board has blamed Metro's shoddy maintenance for a fire in January 2015 that killed a passenger and sickened dozens more.